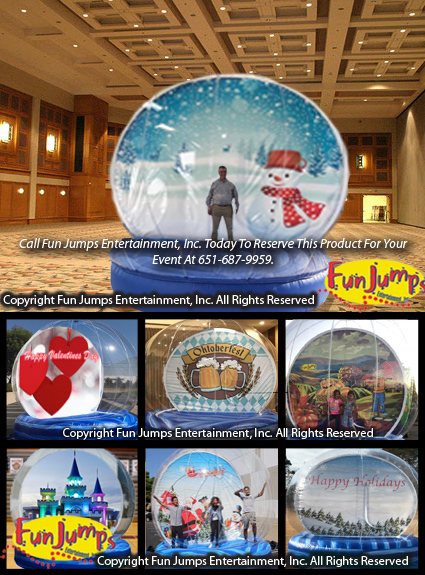 Step inside our life-size Giant Snow Globe the 16 foot diameter Snow Globe Photo Prop - a great attention and addition to any special themed event. A great photo op for up to 8 guests – just enter, pose and take home a great photo souvenir from Giant Snowglobe! We can only setup inside or outside when temperatures are warmer then 50 degrees Fahrenheit with no rain or snow. The Giant Snow Globe is not a moonwalk does not have a jumping option it's made for only photo taking for the Twin Cities, Minneapolis, Saint Paul Area! Different backdrops are available for an extra fee.